discharged to duty 25 Nov’r. I have given him an emetic and will stop his grog till he is better. It has been miserable and cold for some weeks now, with fat, heavy snowflakes falling several days this week. I have begun to notice the sniffles and coughs among the men that accompany said weather. Yesterday, while the Midshipmen were about their lessons on deck, I took note that not a one wore their scarves or gloves even though I could very clearly see their breath in the frigid air. I stopped and scolded them every one saying, "Gentlemen, it is too cold to be on deck without the proper cloathes. I demand that you go below and wrap up proper." The Lieutenant giving the lesson agreed and sent them all down immediately to get more properly attired. 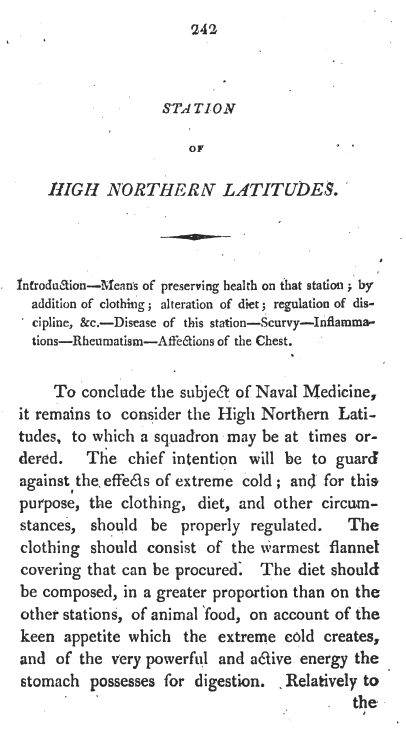 That all men's clothing should consist of the warmest flannel covering as can be procured, especially whilst on deck. Each man should wear a proper scarf, gloves and shoes which has them. 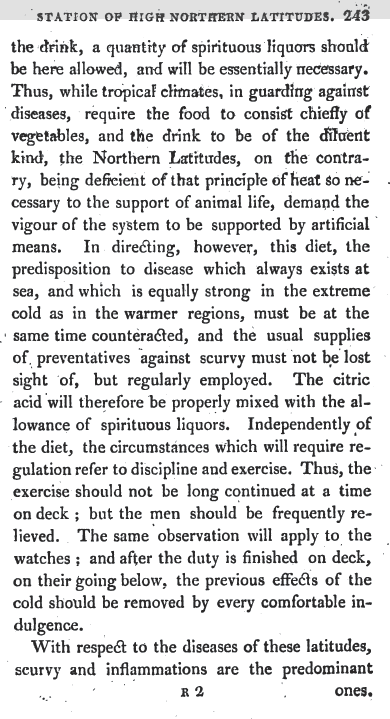 That an increase in the amount of spirituous liquor should be allowed, with doses of citric acid properly mixed in with the allowance to prevent Scurvy. It had been my ardent hope to slip into shore with the cutter under the cover of darkness to recover the Lieutenant and the Doctor and avoid the notice of the Americans. The cutter is far easier to bring in close and could make the return much quicker than then ships boat. Mind I have no military concern. 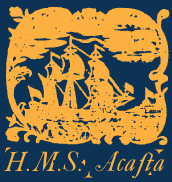 No doubt Acasta could handle any colonial American ship encountered. My concern was of reputation. 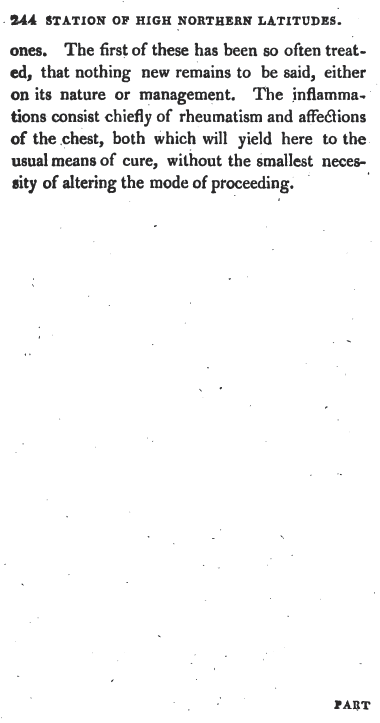 I wanted to avoid Acasta being named as agitating the Americans; that is without proper orders to do so. A night rendezvous failing, we have had no choice but to stand in at midday and watch for our party or perhaps for their signal rocket. This is a complex coastline with a network of hundreds of small islands in inlets and the lieutenant is without a proper horizon to fix his position. He is a competent officer however and the Doctor possess an uncommon intellect. I am sure the delay in their return has a harmless enough cause. We have stood in these last 2 noons without success and without indecent. We shall try again tomorrow. Weather clear. Winds a light northwest. Realizing our position, we returned to the notes from our original interview. The only name that was not mentioned by Miss Waterman that was mentioned by Miss Bosworth was that of Sgt. Baker. We concentrated on the American Riflemen's camp, although many theories were examined, it was believed that Sgt. Baker was real and he was in fact our man. We spent the remainder of the afternoon surveiling the American camp as they went about their business. We noted that every man wore a black haversack at his side. We were visited by Miss Bosworth, who again assured us that Sgt. Baker was in possession of our packet and that it was IN his haversack. She also informed us that his superior had ordered that Baker was not to be left un-escorted when he left camp. Later that afternoon, Midshipman Raley and Mr. Campbell had to return to their duty elsewhere, and Lt. Ramsey and I were issued an invitation to dine at the Harmon Estates before the ball to take place that evening. We cleaned up and made ourselves as presentable as possible for dinner and the ball. Dinner was a lovely three course affair with the finest company, including Mr. Cooper of the American Rifflemen, still in his green uniform, right across the table from me. 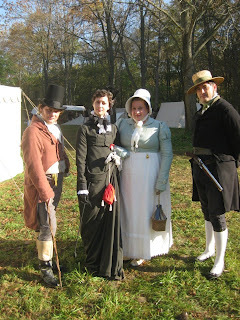 We all departed company and Mr. Cooper excused himself to return briefly to the American camp. Lt. Ramsey and I noted that upon his return, he wore his rifleman's frock and was adjusting his newly retained black haversack at his side. Why would he wear his haversack to a ball? We noted that he had gone all the way back to camp to fetch it. 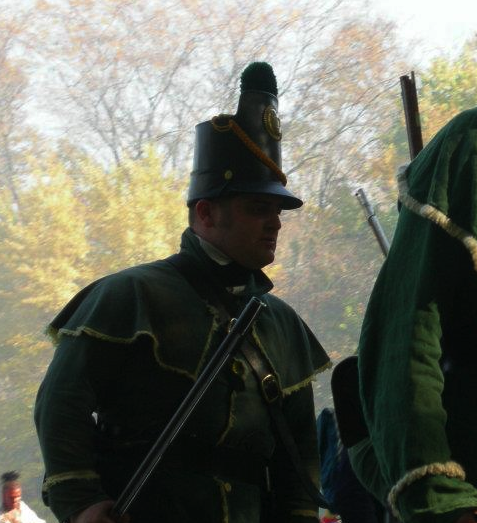 Lt. Ramsey and I looked about to espy the other riflemen, all were wearing their haversacks at the ball! 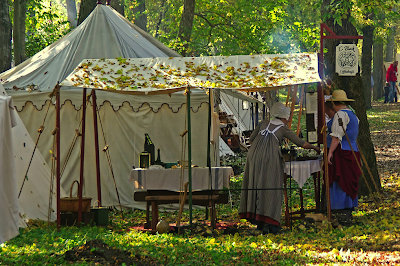 As we stood by the exit to the great tent, one of the riflemen passed, I stopped him. 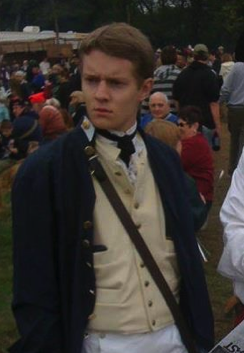 "Are you one of the American Riflemen?" asked I. "Y-yes." he looked near panic. He replied that it was something that started with an A, but even then didn't sound terribly sure of himself. He was obviously nervous. "Why are you wearing your haversack to a ball? That seems like a funny thing to wear to dance in." I queried. "We were ordered to." answered he. 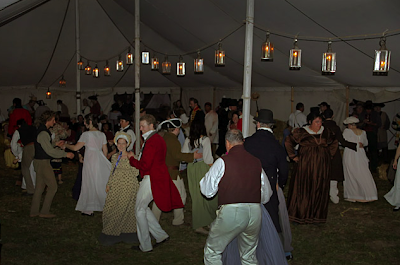 A scene from the Ball. In our minds, this only served to confirm that Sgt. Baker must surely be in possession of the packet and that the entire company had been ordered to wear their haversacks in order to avert our suspicion of only ONE man wearing his haversack to a ball. We would have been able to pick Baker out immediately had he been the only one. Sgt. Baker's only card to play was that we did not yet know what he looked like. After the ball, we returned to the Harmon Estate for a bit of an after party, wherein Lt. Ramsey caught my eye and raised his glass. Quietly, so that others around us would not hear above the din, he said in way of a covert toast, "To King, Country and the success of our mission!" Noon observations 43 47" N 68 17" W. This puts Acasta just to the north and east of Matinicus islands. We will cursie here to stay in positon to retrieve the doctor and lieutenant. It was one of the greatest sea battles in British history and gave birth to a legend. 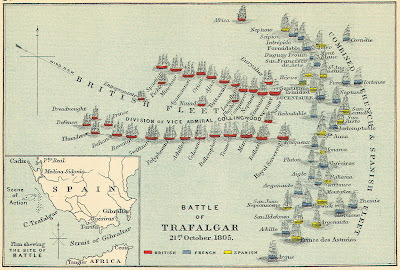 Off the coast of Spain's Cape Trafalgar Peninsula, the British Fleet, led by Lord Horatio Nelson, took on a combined French and Spanish force to determine who would be the master of the waves. England's very existence was at stake for France's Napoleon Bonaparte was poised to send his powerful army across the English Channel to conquer the island. 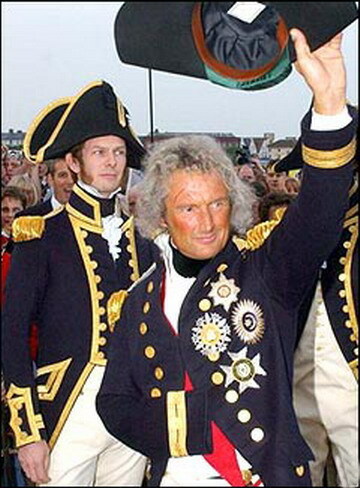 The only obstacle standing in his way was the British fleet. 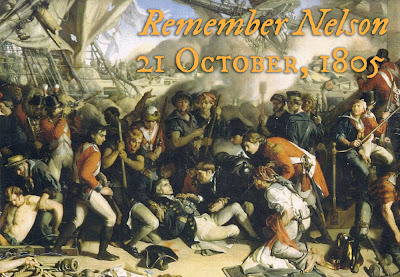 The battle commenced on October 21, 1805 with Nelson's famous words signaled to his fleet: "England expects that every man will do his duty." Nelson had devised an unorthodox battle plan that called for his ships to attack the enemy broadside in two parallel lines, break into the enemy's formation and blast his opponents at close quarters. As Nelson watched from the deck of the HMS Victory the battle soon turned into a confused melee of combat between individual ships. 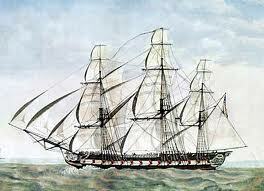 The fighting was at such close quarters that the Victory became entangled with the French ship Redoubtable. Locked together in a deadly ballet, each ship blasted its enemy at point-blank range. 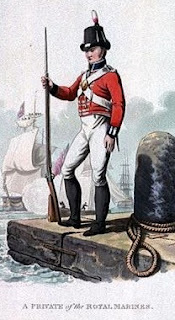 From his perch in the upper rigging of the Redoubtable, a French sharpshooter took aim at a prized target on the deck of the Victory, fired and sent a musket ball into Nelson's left shoulder. 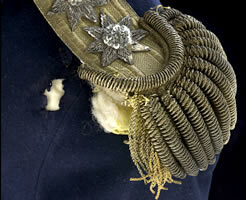 Continuing its journey, the bullet tore a path through the Admiral's upper body before smashing into his lower back. It was a mortal wound. Nelson was carried below decks while the battle raged on. He lived long enough to hear the news of the Redoubtable's surrender and of his fleet's victory after four and one-half hours of combat.
. . . About fifteen minutes past one o'clock, which was in the heat of the engagement, he was walking the middle of the quarter-deck with Captain Hardy, and in the act of turning near the hatchway with his face towards the stern of the Victory, when the fatal ball was fired from the enemy's mizzen-top. . .
Captain Hardy ordered the seamen to carry the Admiral to the cockpit. . .
His lordship was laid upon a bed, stripped of his clothes, and covered with a sheet. While this was effecting, he said to Doctor Scott, "Doctor, I told you so. Doctor, I am gone;" and after a short pause he added in a low voice, "I have to leave Lady Hamilton, and my adopted daughter Horatia, as a legacy to my country." 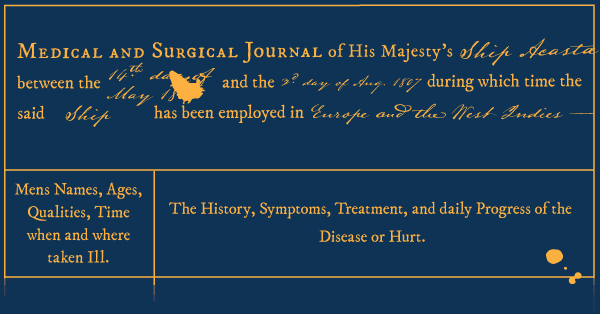 The surgeon then examined the wound, assuring his lordship that he would not put him to much pain in endeavoring to discover the course of the ball; which he soon found had penetrated deep into the chest, and had probably lodged in the spine. This being explained to his lordship, he replied, "he was confident his back was shot through." The back was then examined externally, but without any injury being perceived; on which his lordship was requested by the surgeon to make him acquainted with all his sensations. He replied, that "he felt a gush of blood every minute within his breast: that he had no feeling in the lower part of his body: and that his breathing was difficult, and attended with very severe pain about that part of the spine where he was confident that the ball had struck; for," said he, "I felt it break my back." 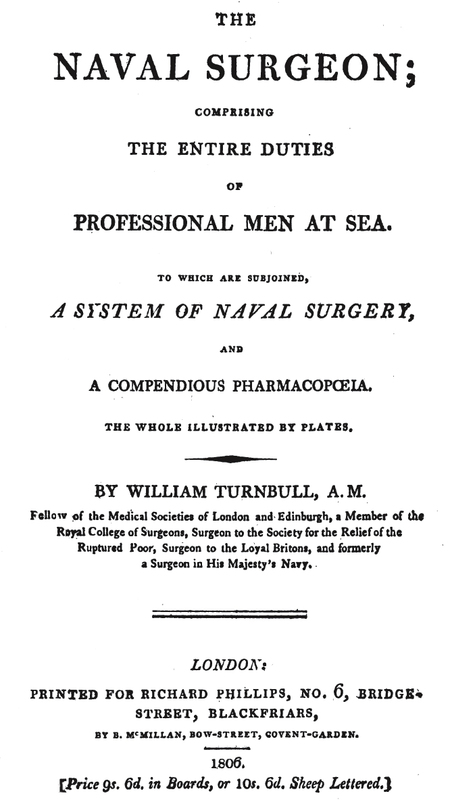 These symptoms, but more particularly the gush of blood which his lordship complained of, together with the state of his pulse, indicated to the surgeon the hopeless situation of the case; but till after the victory was ascertained and announced to his lordship, the true nature of his wound was concealed by the surgeon from all on board except only Captain Hardy, Doctor Scott, Mr. Burke, and Messrs. Smith and Westemburg the assistant surgeons. An hour and ten minutes however elapsed, from the time of his lordship's being wounded, before Captain Hardy's first subsequent interview with him. . . 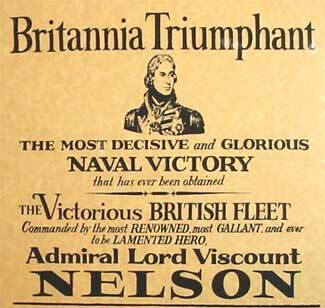 They shook hands affectionately, and Lord Nelson said: 'Well, Hardy, how goes the battle? How goes the day with us? '- 'Very well, my Lord,' replied Captain Hardy. . . 'I am a dead man, Hardy. I am going fast: it will be all over with me soon. Come nearer to me. Pray let my dear Lady Hamilton [Lord Nelson's mistress] have my hair, and all other things belonging to me.' . . .Captain Hardy observed, that 'he hoped Mr. Beatty could yet hold out some prospect of life.' – 'Oh! no,' answered his lordship; 'it is impossible. My back is shot through. Beatty will tell you so.' 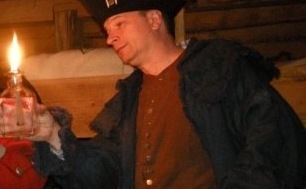 Captain Hardy then returned on deck, and at parting shook hands again with his revered friend and commander. 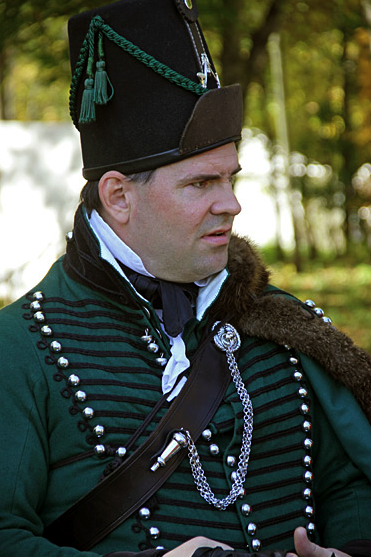 His Lordship became speechless in about fifteen minutes after Captain Hardy left him. . . and when he had remained speechless about five minutes, his Lordship's steward went to the surgeon, who had been a short time occupied with the wounded in another part of the cockpit, and stated his apprehensions that his Lordship was dying. The surgeon immediately repaired to him, and found him on the verge of dissolution. He knelt down by his side, and took up his hand; which was cold, and the pulse gone from the wrist. On the surgeon's feeling his forehead, which was likewise cold, his Lordship opened his eyes, looked up, and shut them again. The surgeon again left him, and returned to the wounded who required his assistance; but was not absent five minutes before the Steward announced to him that 'he believed his Lordship had expired.' 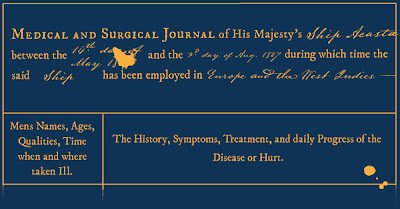 The surgeon returned, and found that the report was but too well founded: his Lordship had breathed his last, at thirty minutes past four o'clock; at which period Doctor Scott was in the act of rubbing his Lordship's breast, and Mr. Burke supporting the bed under his shoulders. 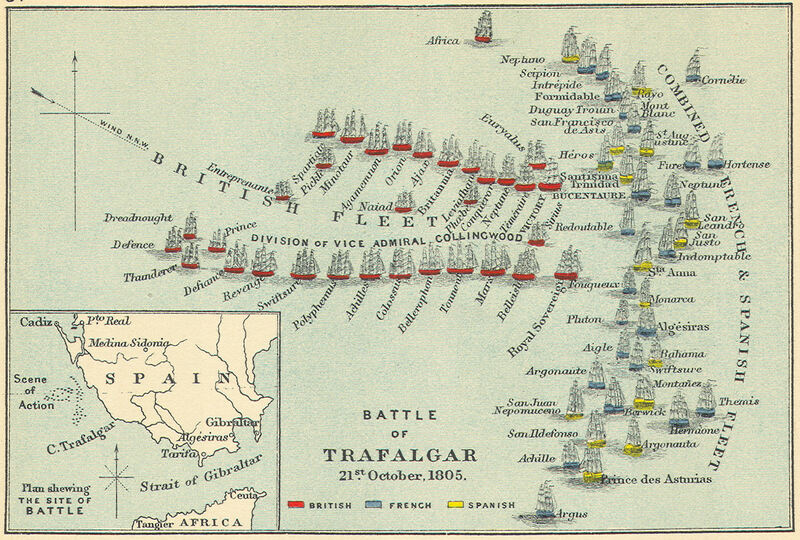 References: Dr. Beatty's account is found in: Beatty, William, The Death of Lord Nelson (1807); Adkins, Roy, Nelson's Trafalgar: the battle that changed the world (2005); Howarth, David A., Trafalgar: the Nelson touch (1969). 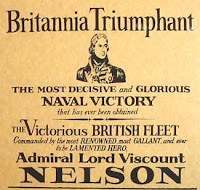 Text taken from: "The Death of Lord Nelson, 1805", EyeWitness to History, www.eyewitnesstohistory.com (2007). Having decided that our best opportunity to take Mrs. Burns and the prize was during the American’s next engagement, we divided in order to keep our numbers small. Midshipman Raley and Mr. Campbell went to view the actions being taken, down on the River, while The Doctor and I broke away back into the town in order to dine at the Ordinary and to make a few purchases, one of which was a lovely new telescoping glass that the Doctor had his eye on for some time. 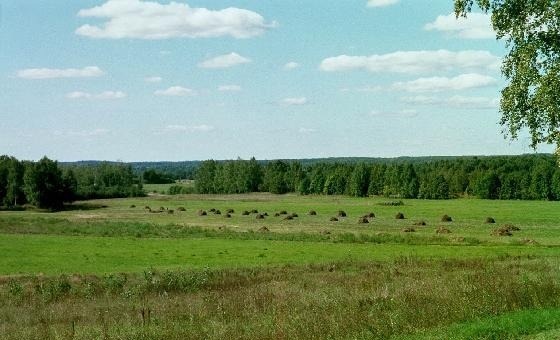 Having used our time in leisure all the while excited with the anticipation of our coming victory we rendezvoused with Messers Raley and Campbell within the first few volleys of the second engagement betwixt the King’s men and the Americans. Spread out, we made our way to the American camp hoping to ensnare our quarry in an ambuscade. But upon arrival in their camp we quickly ascertained that Mrs. Burns had not, as we assumed, planned to view the battle in support of her husband and his company, but instead she had retired to the town. Making use of what time we had we marched at the double into town to search for Mrs. Burns where we found her inside one of the shop on the main road through town. Instantly, we interviewed and demanded to see inside the basket that she carried. We found the packet… no, on closer examination we only found a packet. It seems that the latest fashion plates from England and France had just arrived and Mrs. Cooper had taken it upon herself to send copies to some of her friends. These past 3 days we had experienced a foul east south east blow straight up the harbor channel with heavy rain and fogs keeping Acasta bottled up. On Saturday we had a slight break in the wind but was able to beat out no further that the lighthouse on McNabb’s Island before being blown back and forced to take shelter the that island’s lee. Weather this morning broke fair and bright winds north northwest. We have attained the morning tide and are currently riding out at to the South East at 9 knots. Noon observations, 44 31’ N 63 28’ W. This puts well clear of the Harbor mouth and clear of the shoals of the South East of McNabb. We entered the American Camp and began our investigation. 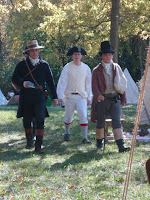 We asked about with several of the riflemen as to the whereabouts of Sgt. 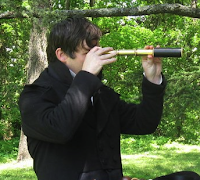 Baker... all the riflemen knew the gentleman we spoke of, but none could seem to agree on where he was. On our way down the hill towards town, we spotted a gaggle of ladies coming down the hill towards us. Mrs. Birkenbach and Mrs. Burns were among them, Mrs. Burns carried a small basket under her arm. There, from the end of the basket I espied a packet peeking out! 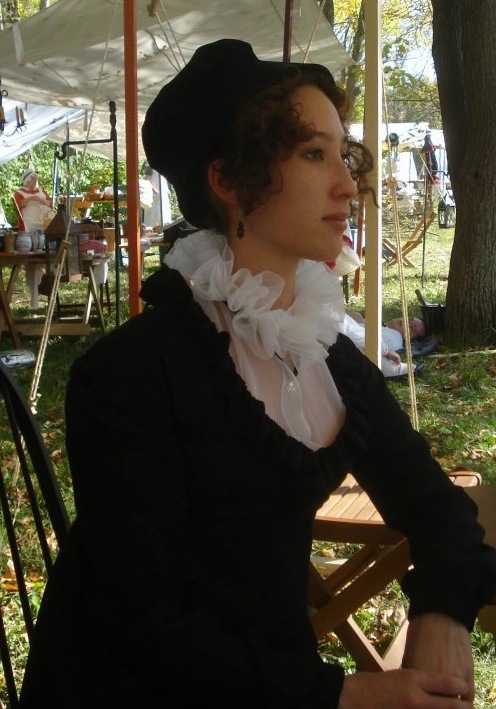 The middle of the American Camp was no place to affect an arrest, so Lt. Ramsey, Midshipman Raley, Mr. Campbell and I adjourned to the Widow Black's Coffee House to make plans. We were now decided that Miss Bosworth had perhaps fed us the information about Sgt. Baker as a ruse to lead us away from the true culprit. We played One and Thirty and partook of the widow's fines. We gambled and began to make plans in how we would each spend our shares of the prize money, even going so far as to divide it up in various ways accounting for Miss Bosworth's assistance or the lack thereof (with the mathematical aid from the widow Black herself.). All the while we made plans to detain Mrs. Burns, deciding that the best way to take her with ease would be to do so during the afternoon engagement when the men were all away. I have ordered the Blue Peter up. Acasta is re-provisioned and we do have 10 hours to catch the tide. However, after some visits ashore, I fear the crew may have been over socialized by the local …entertainments and thus slow to their duty. We will not miss the tide. We have been ordered to cruise SSE keeping at least 100 leagues off shore. This I am sure in preparation for the restoration of the Doctor and the Lieutenant to Acasta form their personal trip. At 10AM on Saturday morning we rendevoused with Mr. Midshipman Raley late of the Terpsichore and Able Seaman Mr Cambell of the same, who were to assist us in our mission. Shortly after, we encountered the courier, Miss Waterman and her travel companion Miss Bosworth. I delivered my letter of condolence to Miss Bosworth, who was in mourning for her recently departed brother, and bid the ladies good morning. As they departed, we signaled Mr. Campbell to follow them. Mr. Campbell was our first card to play. Please allow me to pass on to you the my most sincere condolences for the recent misfortune of your family. Because I respect you and your unfortunate situation, I shall not mince words. It has been brought to my attention that the loss of your brother Thomas places your family in a delicate financial situation with your creditors back in England. Your Father owes a good deal to his creditors, Young & Erskine of Glasgow as well as loans from the Bank of England itself for the capital required to start his plantations here. You may not have been made aware, but with the harsh winter of '09 and last summer's drought, your Father's income from his exports has flagged and the creditors have begun to circle like vultures to collect their due. I have been assigned by the Royal Navy to capture a treacherous Spy that is here in this country. It is the belief of the Navy that your friend Miss Emily Waterman, is in possession of a packet of papers that she is to pass off to the unknown Spy. It is the intent of the British Government to ferret out the identity of this Spy and place them under arrest. Your need not fear for the safety of your friend, Miss Waterman, it is our belief that she is being forced to act as courier against her will. The Navy's only concern is finding out the identity of the Agent she passes the sensitive packet on to. If you are able to reveal to us the recipient of said packet and a successful arrest can be made, the packet returned with its contents intact, it is with great pleasure that I inform you that I have been authorized by the Admiralty Office in Whitehall on behalf of His Majesty to offer a settlement that they hope will be satisfactory to all parties concerned. In return for revealing identity of the recipient of the packet, the Crown will pay off your Father's hefty debts and give you an additional Fifty Pounds for your cooperation. It is my firm belief that Thomas would not have wanted to have left this mortal coil and endangered the future of his parents and dear sister. This simple act will ensure your family's well-being into the foreseeable future. After a long half-hour of waiting for the packet to be delivered to the unknown American Spy, we left the British encampment to detain the courier and to begin our investigation. We separated Miss Waterman and Miss Bosworth and questioned each of them alone. Miss Waterman, when questioned about who she had seen in the past half hour, gave up the names of a series of ladies that she had seen that morning. ...and that her route took her through the Indian camp straight into the American camp, then back around down the main road to 96 Warehouse. The route was confirmed by our tail, Mr. Campbell. 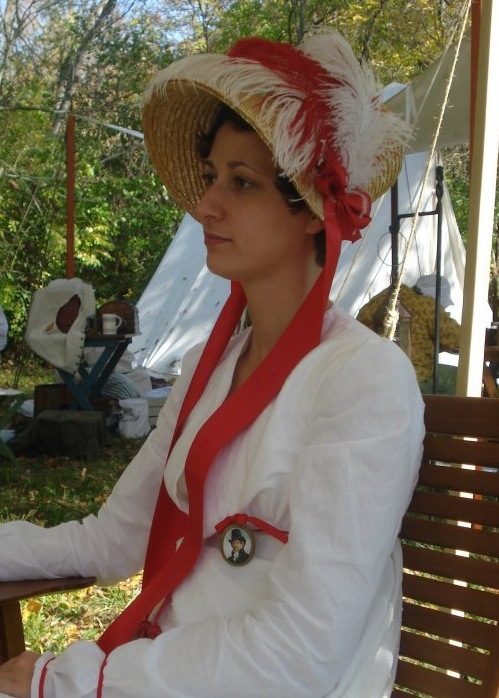 Miss Bosworth gave up the same list of names, except that she stated that while they moved through the American camp, Miss Waterman passed the packet on to a fellow by the name of Sgt. 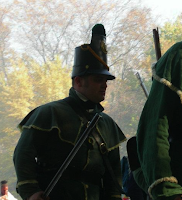 Baker with the riflemen encamped there. The Doctor, Mr. Campbell, Lt Ramsey on the hunt. Could it have been so simple? Sgt. Baker of the American Rifle Company? We went to investigate, following the path taken by the two young ladies into the heart of the American Camp. In my cabin, throbbing head, blackened eye. With the ship’s provisioning well underway I obtained three days of leave with permission to sleep off the ship. The ward room had decided to go shares on livestock, wines, cheeses and other stuffs. I had volunteered, in light of my good fortune in the way of leave, to do the marketing. After having been rowed ashore, I first headed for the markets on Water Front Street. Purchased 6 cases of port, 2 casks of Burgundy, and 2 casks of Claret. The three wheels of cheddar came quite dear, the merchant claimed privatizing. The live stock acquisition was more arduous due to the seller being located across Barrington Street on the far side of the Governor’s house. There 2 pigs, 3 lambs, and a score of hen were gained and sent back to Acasta. Meals should be inordinately pleasing for the next few weeks aboard. 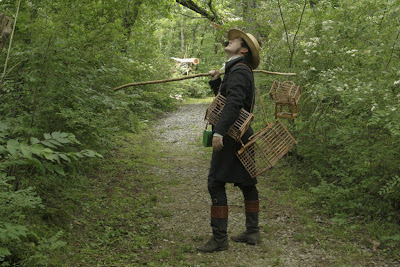 With these tasks complete, I was able to turn to my social duty’s as I had been invited that afternoon to tea at an old family friend’s home, the widow Murphy…..
We have arrived in the Indiana Territory after a good deal of rather exhausting covert travel in order to intercept our target who, we have discover'd, is still in possession of the packet. We hope to be able to surveil her whilst she makes contact with her counterpart. Then once the packet has been passed, we hope to be able to effect an arrest of the still unknown American agent. There is a great row of shops nearby, and I should very much like to purchase a new telescope with greater magnification, if one is available. It is our belief that there are Royal Naval officers encamped in the area and I have discussed with Lt. Ramsey the possibility of enlisting their aid in making the arrest. We will have to be careful, as there are several large encampments of American soldiers nearby as well, and neither of us is anxious to encounter them if we do not have to. We are, each of us, arm'd with our service pistols and a few cartridges, and the red rocket, which MUST be saved for our return to the coast so we can signal the Acasta. The ship is well anchored in Halifax Harbor. I have made arrangements for the provisioning of the ship. We are especially short on fresh water and fire wood. We have also requested from the Naval yard various spars and booms for either replacement of losses or for spares along with various other items. I also expect additional salted beef and rice, quantities and quality as yet unknown. The doctor has requested I secure him a fresh supply of mercury as it is often the Captain’s decision to take the ship out of discipline at an extended anchorage such as this. We have kept to the small villages and towns in an attempt to avoid unwanted attention as we move ever further inland. I have discovered over the course of our travels that Lt. Ramsey (formerly un-named) has a terrible 'American' accent and his attempts at such cause raised eyebrows everywhere we may stop. Yesterday, we were nearly refused service at a tavern because the innkeep decided Mr. Ramsey sounded 'too English'. This morning on the road we encountered a farmer who called out a greeting to us, and upon Lt. Ramsey's reply, the farmer eyed us with suspicion until we were out of sight. The Lieutenant and I have discussed it quietly amongst ourselves and unanimously agreed that we do not like being this far from the ship. The share-out of prize-money is given below in its pre-1808 state. (d) 1/8 Lieutenants of Marines, Secretary to Flag Officer, Principal Warrant Officers, Chaplains.